This reprinted work is soft cover, cerlox bound, 8.5 x11 in size, approximately 400 pages, includes the original photos that were at the back of the book, as well as the sketches and photo of Robert J. Fraser. It also includes an addenda, some obituaries, a few pages on Mr. William F. Rannie, who originally published this work in 1959. Included, is the 1984, DUNDEE CLAN FRASER ON THE MOVE updated January 2001, work Frasers of Dundee, Quebec by Barry Fraser, Chatham, Ontario, with permission. The index has been expanded a little as well. A dedication page has also been included. I scanned this work into my computer, proof read and spelled checked it. We hope that the results will be to the readers satisfaction. The following is taken from the back cover of the original dust jacket. former Dominion Hydrographer, was born in Ottawa, a great-grandson of a, Highland crofter of Strath Dores, Invernessshire, who established the first home of Clan Fraser in, Dundee Township, then the Indian Lands of the Iroquois. His grandfather, the "Patriarch of Loch Garry", was a Glengarry farmer, promoter of municipal affairs, Warden of the United Counties, and Kenyon's "Public Servant". The author's father was Auditor General of Canada, the late. John Fraser, I.S.O. After forty-five years of charting Canada's coasts and waters, and retirement from public service, he was "drafted" to compile AS OTHERS SEE US, a record of "How the ancestors of a large Scotch family and kin established themselves in Canada, multiplied, and dispersed, and where later generations are living- today." "To prepare a history of a community, one needs piece together biographies of its earliest people, good and bad, and of -their progeny, great and small, both indigenous and scattered; tell from whence they came, and why, and how they lived, and loved, and fought, and died." The story, however, is not altogether about people, though more than nine hundred persons have been named. It treats of related events, the steam- boats and pilots of Lake St. Francis and the Long Sault, the primitive rural industries,:, and the early church in Dundee and. Glengarry. With breadth of tolerance and candid boldness, the historian. has "threaded his way through a maze of interwoven bloodlines", followed "Scots of the Seaway Valley" through Dundee and Glengarry concessions, some on to Ottawa, and others beyond, likening himself to the "Traveller with a Notebook", asking only: "Let me journey its roads; pause where I will, peer where I choose; read the symbols as a savage read the, trailways of his wilderness; be not bounden by the hedge-rows, nor the straightened way; only let me, and I'll find me the story of its people." 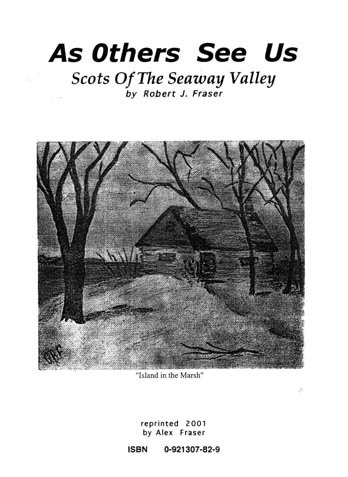 The publishers gladly submit the work to descendants, and to others, of Seaway Valley pioneers, whose rewards have come of forebears' "toil and sweat and dangers faced, brawny wrestling with the untouched wilderness", some of whom "went leagues beyond the known bounds, to put their sons into places of judgment and of rule." Mar 9.01; orders now received is 87, this surpasses my efforts of 1992-94 when only 55 orders were received. This reprint is being officially announced as available on Monday Feb. 19, 2001. For those so interested, this work is now available, copies of this work are printed to fill orders received, upon receipt of payment, orders will be shipped. On page 334 in the Index a typo correction is required.